Mash pH is an important concept for all grain brewing. While you can make “good” beer without worrying about pH, brewing truly great all grain beer relies on understanding the concept of mash pH and its impact on beer. You probably had a simple introduction to the concept of pH in your High School Chemistry course. pH is simply a measure of how acidic or alkaline a solution is. It is measured on a scale from 1-14 with 7 being a neutral reading. Pure water would have a reading of 7. Readings below 7 are said to be “acidic”, and readings above 7 are said to be “alkaline” or “basic”. The scale is logarithmic (technically pH is the log of the hydrogen ion concentration or pH = -log[H+]), so a pH of 5 is 100 times more acidic than a pH of 7.
pH is typically measured using either paper test strips or with an electronic device called a pH meter. Some brewers also use chemical test kits (like you might if you own a pool) to measure pH. We can talk about the pH of your brewing water, the mash mixture, the pH of your wort and even the pH of the finished beer. Each of these has a slightly different impact on the beer, but the most important for the all grain brewer is the pH of the mash mixture while its in the mash tun. In particular we want to keep the measured pH of our mash in the 5.2-5.5 range with a preference towards the lower end (5.2). Mash pH is very difficult to predict in advance. 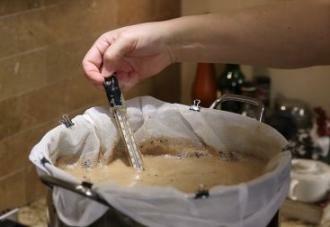 Though some large scale commercial brewers are able to accurately predict mash pH for certain recipes, they are often brewing the same recipe with exactly the same malts under exactly the same conditions repeatedly. Unfortunately variations in malts and water make this impractical at the home level, where often we brew with different recipes and ingredients every single time. Water Used: The chemical composition of the water is a large driver in mash pH. Calcium, magnesium, carbonates and bicarbonates are all drivers of mash pH. While I can’t cover a complete course in brewing water or residual water alkalinity here, its important that you have good brewing water to brew with. Most water sources are slightly alkaline, so they tend to drive the mash pH above the desired 5.2-5.4 range. Malts: Malts tend to be acidic, which means that they lower the mash pH of the overall mixture. Dark malts in particular can be very acidic, which is why many darker beers require little mash pH adjustment. Lighter malts have less buffering capability, so lighter beers often need additives covered blow to drive the mash pH down to the desired level. Unfortunately the acidity of malts varies widely and is not measured and published, so prediction of mash pH in advance is very difficult. Because it is almost impossible to predict your mash pH in advance for a given recipe, you must measure and then adjust the mash pH for each batch you brew. You can measure the pH using precision test strips (get ones specifically designed for brewing), a pH meter or a chemical test kit. Be sure that your measuring method has the sensitivity to measure small changes in the 5.2-5.4 range – some test strips and kits are not designed to measure these small ranges. Hydrochloric and Sulfuric Acid – Used by many commercial brewers, these acids are usually not widely available to the public. These can be dangerous to handle (are both highly caustic) and are not recommended for use by home brewers, and also can create significant off flavors if misused. Also do not use the muriatic acid found in pool supply stores as it is not food grade and should be avoided. This was a brief overview of why its important to manage your mash pH – if you have your own tip please leave it below! Thanks for joining me on the BeerSmith Home Brewing Blog. Be sure to sign up for my newsletter or my podcast (also on itunes…and youtube…and streaming radio station) for more great tips on homebrewing. Also check out the How to Brew Video series I shot with John Palmer if you want to learn more about all grain brewing. When exactly do you adjust the mash pH? Is if after the mashing is complete but before the boil or is it done earlier than that? Very informative.However,I have the same question as DaveS point it. Typically you would measure 5 minutes into your mash to get your original PH then adjust. Give 5 and re-test. I have found that to be effective. You can even check you water ahead of time as well, especially if you are on a well. If you are adding Calcium carbonate you need to add it to the mash directly as it is not very soluble. If you add it to mash water, you end up with a white sludge in the bottom of your hlt. Where is gypsum? Calcium Sulfate? When do you add it and why? Seems like one of the easiest ways to lower pH. It is quite possible to predict mash pH fairly accurately in many cases depending on how closely the models for the malts used in the program match the actual properties of the malts the brewer is using. Some programs are better than others at this. As there are variations in the ‘same’ malt between lot numbers, growing seasons, cultivars, moisture content… it is not possible to get spot on predictions unless the brewer measures the properties of the individual malts himself and it is far easier to just check the pH of a test mash. Buffers, such as 5.2 stabilizer do not work because, while it is true that phosphate buffers are effective this is only, as is the case with any buffer, near one of the pKs of the acid (phosphoric acid). Mash pH is about as far away from the pKs of phosphoric acid as one can get. This product does not increase the hardness of mash or water treated with it because the phosphate salts in it are sodium salts and sodium does not contribute hardness. I’ve noticed while shopping for PH meters that most models that incorporate ATC (Automatic Temperature Correction) only go up to 122 deg F (50 deg C). Is this acceptable, or should I look for a higher end tester that has ATC up to 100 deg C?